My name is Justice. I represent the ideal of perfect justice. I wear a blindfold because I rule based on the law, not on factors such as the race, wealth, power, or social status of those who come before me. 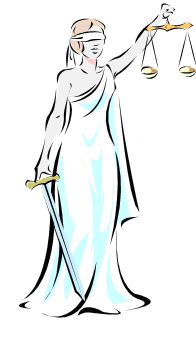 I carry an empty, balanced scale because I stand ready to receive and weigh fairly the evidence and legal arguments that are presented to me. And sometimes I carry a sword, to symbolize the power of the rule of law to help shape a just society. For centuries, I have signified that justice requires the fair and impartial administration of the law, without fear or favor.